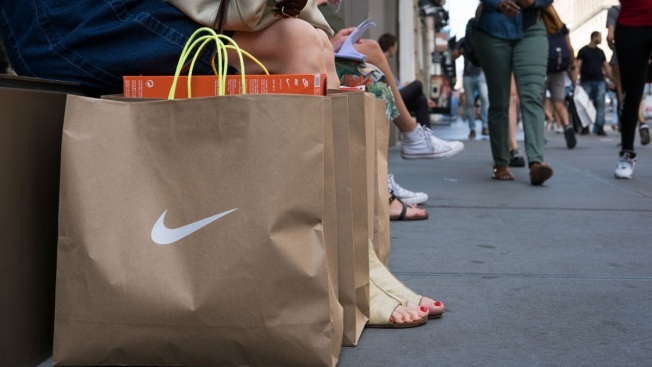 In this June 15, 2017 file photo, a shopper sits next to Nike shopping bags outside of the Nike SoHo store in New York City. Shoppers can already find Nike goods on Amazon, but they are sold by third-party sellers. Nike said the new partnership with Amazon will help it better control its brand's presentation on the site. Only a small selection of shoes, clothing and accessories will be available at first. But Nike may sell more products on the platform if the test is successful. "We're in the early stages, but we really look forward to evaluating the results," said Nike CEO Mark Parker, in a conference call late Thursday. Earlier this month, Nike said it would slash 1,400 jobs in a restructuring aimed at selling more shoes directly online. It already has deals with Amazon's rivals in China and Europe, and Nike is making its sneaker-selling apps available in more parts of the world. In addition to the Amazon deal, Nike also partnered with Instagram to make it easier for users to buy sneakers through the photo-sharing app. Selling directly through Amazon could give Nike greater access to millennials, analysts from Nomura said on Friday. Those analysts also said Nike may be able to better control prices on Amazon and help reduce the number of counterfeits being sold. Seattle-based Amazon.com Inc. did not respond to a request for comment Friday. Nike also reported better-than-expected earnings and revenue for the previous quarter on Thursday, and the Beaverton, Oregon-based company said it expects revenue to rise in the current year. Shares of Nike Inc. jumped $4.43, or 8 percent, to $57.60 in morning trading Friday.